The tug of the old school tie drew the chairman of the Tata Group to the Times of India building on Monday for an interactive session with the students of his alma mater, The Cathedral & John Connon School. The one-hour question and answer was organised by the TOI’s Newspapers in Education (NIE), a campus broadsheet that goes to 2,000 schools across India. Dressed in corporate uniform of dark suit and cobalt blue tie, Tata looked somewhat nervous at the prospect of going back to school. The rows of young Cathedralites facing him had come all primed to ask meaningful questions – everything from “values learnt at school” to “the message for India’s youth” to “were you a backbencher?”. Clarifying that only the last three years of his schooling were at Cathedral – the rest were at Campion – Tata said that he had “a great sense of guilt” for not staying connected with his school and that he was grateful to Isaacs for having put him back in touch. 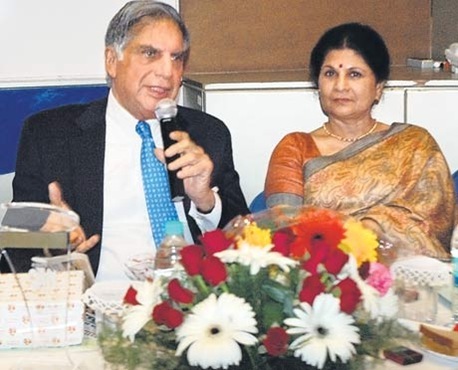 In his opening remarks, Tata said he assumed the school had changed a great deal from his time when “learning was mechanistic” and “we were whacked on our hands” even as the country itself had moved from a licence raj with a “third-world character” to a more exciting moment in its history. He fielded the questions in his characteristically shy but solemn manner, occasionally displaying a flash of self-deprecatory humour. Asked why he hadn’t thought of entering politics, he said, “I have a lot, in a negative way…” “Why so?” persisted his young interlocutor. “Because I am wise,” he shot back gleefully. Question hour was neatly divided between ‘Ratan in Cathedral’ and ‘Tata & Nano’. The backbencher query, which evoked a round of laughs, had him bite his lower lip. “I was very shy,” he recalled. “One thing I have never recovered from is a fear of public speaking. The only people speaking publicly in school were those reading out the sermon at assembly and those participating in debates. I wasn’t among either. Nor was I into too many extra-curricular activities. In that, I missed the full culture of Cathedral and it’s my loss. Cathedral for me was a mixed bag. I particularly remember a mathematics teacher who, I felt, was determined that I never complete school. 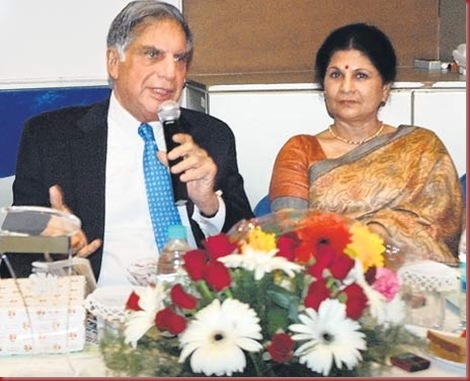 He almost succeeded,” smiled Tata, mindful that he now knows more than a thing or two about multiplying assets. His biggest challenge has been to protect and preserve the value system that was instituted by JRD Tata -“his shoes were too big, so I had to build my own persona” – despite young men in a hurry prophesying that ethics and growth were not good bedfellows. The House of Tata’s retort has been to bag Corus and Jaguar. “I hope whoever succeeds me cherishes this value system,” he said. 4. Corruption has to be weeded out at all levels.